IntelliJ IDEA is a great IDE for Java, Groovy, Flex, Python, Ruby and many other languages. The text editor with camel-hump completion, and version control support are so great that it may be hard to switch to another editor which may lack some useful features. So, when a need arises for me to code in a language that’s not listed on the features page, I just teach IDEA some basics about that language, and feel much more comfortable than I would if I was editing a plain text. Luckily, you don’t have to write a plugin for that, it is possible via the GUI. This brings a dialog where you can provide some knowledge about Haskell: case sensitivity, brace matching settings, ways of defining comments and keywords. You can have up to four lists of keywords, which will be colored differently in the editor. And, of course, all of them will be auto-completed. This entry was posted in Tips & Tricks and tagged Code Completion, Editor, Haskell. Bookmark the permalink. Very stricted options. What about hex numvers like 0ABCh (like in asm)? What if sets of reserved words depend on context? 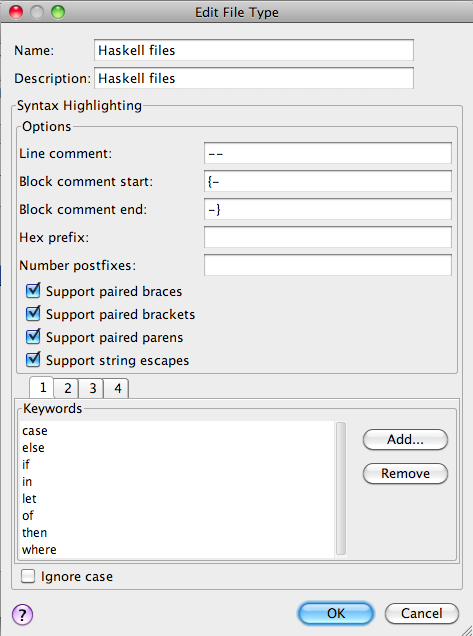 Why not to provide regular expression like syntax for comments, numbers, reserved words, etc? I love Intellij and that’s the IDE that I use for all the programming work I do. Sometimes I need to edit files that are not part of any project – just one-off edit tasks. I’d be so cool to do this in Idea because of its fantastic editing capabilities. But starting IDE for such a small thing is an overkill. I’m thinking there would be a market share to capture if you provided a quick startup and memory efficient editor to handle such edits which do not require a full-blown IDE (with project mgmt and all other goodies). It could replace notepads, textpads, ultraedits, E, etc… I believe all the components are already there. It’s probably just a matter of bundling them together in a scaled-down version. I have to agree with Leonidos. Not much to brag about here 😉 Very very limited capabilities, only works for the most simple of syntaxes. Try using this to highlight markup, ini-files, yaml (I know it’s build in), .htacces, embedded regex, etc, etc. Not a very useful feature in its present incarnation. Why not develop some kind of dsl to do the highlighting? Perhaps something like what vim has? Can you also include this in Language Injection? I have for example XQuery or SPARQL but they are usually tied to another file (XML, Java…) so without language injection they are quite useless and unreadable. Slawek, this is possible by some hacking in IDEA CE sources, but AFAIK we don’t plan to release an editor separately. Though the plans may always change. Natan, that’s a bit hard because the custom file type is a file type and what you inject is a language, and these are different notions. But I agree that would be a good idea. A YouTrack issue please? Is there a place to share custom file types for IntelliJ? Kind of like your plugin repository… but a file type repository. Colin, not yet. But feel free to file a feature request. If custom file types were available in the Settings->Inspections dialogue this would be a lot better. How they could be available? Inspections don’t know anything about custom file types. If you want to provide your own inspections for a file type, you can do so by writing a plugin. Kevin, sounds reasonable. Feature request please? I like the idea of simple syntax highlighting..I wish to add gawk/awk to my current project, and I have stumbled upon the idea of just modifiying the perl file type (its editable and has room for keywords. Only the Key words have to be added one at a time. Any chance they can be bulk imported? Is there an xml stored somewhere that can be modified? Toar Shell, there’s an XML in config/filetypes. Please see http://devnet.jetbrains.net/docs/DOC-181 for the config directory location. File modifications while IDEA is running may not be applied. Hi. Nice feature. Any idea what it means if I’m not allowed to insert any comments into a file with my new type? The file type gets recognized ok, the keywords are highlighted, but I can’t comment out code, neither line nor block. The option is greyed out in the menu. Chris, this sounds strange. Could you please file a YouTrack issue (http://youtrack.jetbrains.com/dashboard) and provide screenshots of your file type configuration there? I would like to have a custom format for a simple indentation-based files. It’s only achievable via a plugin, and it’s not an easy task. The starting point is implementing com.intellij.openapi.fileEditor.FileEditorProvider. In this very special case I want to handle *.rpy files with IntelliJ which are scripts used by the Game Engine Ren’Py. The format is fairly straightforward and easy and doesn’t have excessively many keywords for me to hack into my custom filetype. However, whenever I hit the Enter key after a colon, I’d like the next line to be indented. Is something like that possible in the current state? If so, how? No, it’s not possible out of the box with custom file types, sorry. You’d have to write a small plugin for that. Implementation-wise it indeed seems easy, but UI-wise less so. How to call the setting for these “words”? Would it be a feature useful also outside your case, for someone else, and if yes, which words would there be? Anyway, I think filing a feature request at https://youtrack.jetbrains.com/newIssue is a good idea, and we can continue the discussion there.